4. in the first row, the first part of the double chain is worked away from the twisted chain. Running stitch lines ,border the linked double chain stitches in the second row. 5. individual set of double chains and twisted chain are worked to form a border, a line of chain stitch is worked over them in the first row. 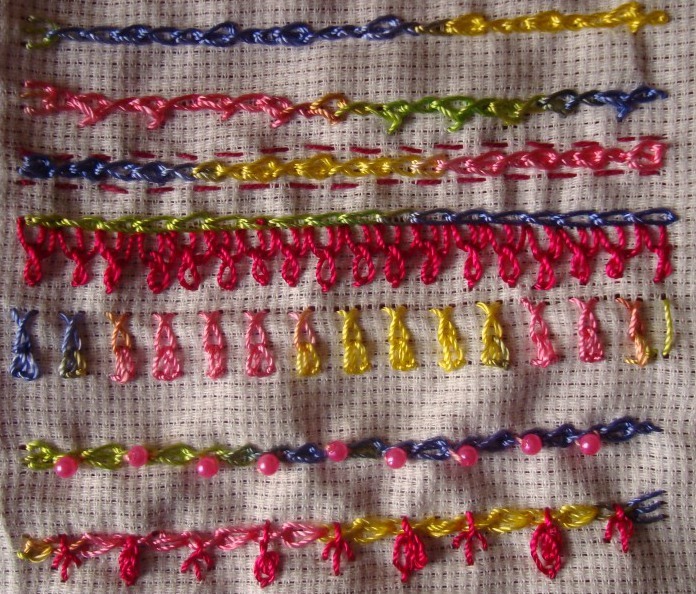 Individual set of twisted chain and double chain are worked as isolated stitches to form the second row. 6.pink pearl beads are worked over the twisted chain in the first row, fly stitches and oyster stitches are worked over a line of linked double chain in the second row. Though this stitch was an easy one to work, I was not inspired to do more experiments of this stitch. And the 32nd week’s cast on stitch awaits me! Got scared of 33rd week stitch- cast on stitch, so jumped on to 34th week stitch of the TAST 2012 stitch challenge by SharonB- linked double chain. This seems to be an easy stitch. The details.1. the first row is the basic stitch. In the second row, longer version of this stitch is worked. The third is the shorter version of the stitch. 2. in the first row, the twisted chain stitches are longer than the double chain stitches, in the second row, the double chains are worked longer than the twisted chain stitches, two lines of linked double chain are worked together in the third row. 3. the first row of linked double chain stitch is laced with rimjim thread. 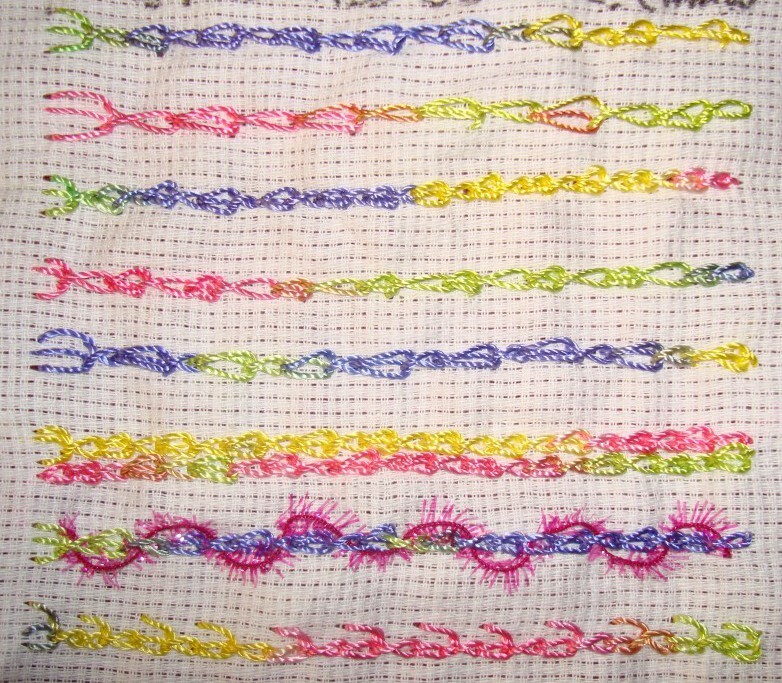 In the second row, the second chain stitches are worked outside the twisted chain stitches. Two single chain stitches are worked after each double chain in the third row.